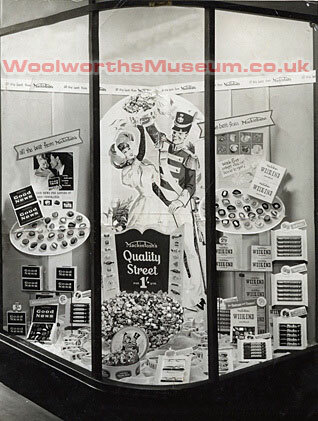 Over a century of trading Pic'n'Mix became Woolworth UK's signature brand. Despite weigh-out sweets being stocked by many other retailers, both large and small, the chain had made the range its own, and its pic'n'mix brand name had entered the language as the very definition of a self-selection asssortment of candies. This didn't happen by accident. The marketing had been carefully choreographed down the years through a pic'n'mix of advertising and public relations. Frank Woolworth had a rule: "Dress your windows twice a week with big leaders attached - that is our advertising". He considered 'big leaders' - retail jargon for great special offers - enough to promote his stores, avoiding the cost of advertising. The British subsidiary followed the guidance throughout its first fifty years. It relied on word of mouth, as shoppers showed of their purchases, bolstered by eye-catching window displays. Careful planning ensured that all of the key ranges got a turn in the window. Sweets were no exception. Both countlines and weigh-out pic'n'mix featured regularly at street-side. The layouts were so elaborate that they became a talking point, that was widely shared in the social media of the era - word of mouth. Window displays of sweets were particularly popular with customers and staff. They proved highly effective at drawing people's attention to new lines on the pic'n'mix counter and giving them a try. Suppliers were keen to help, knowing this would boost sales. They made special showcards and shopfittings to promote their lines. 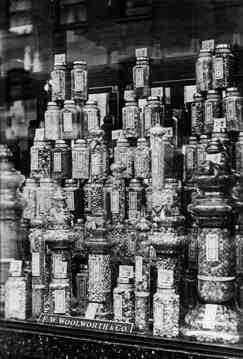 Sometimes they used jars in the manner of an independent sweet shop, but more often chose to show the unwrapped sweets in glass dishes, with some deploting plaster replicas to avoid damage from the sun's rays. 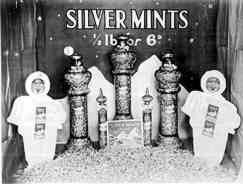 These displays promoted a half a pound (227g) of sweets for sixpence (2½p) rather the regular eight pence (3p). Most offers either offered double quantity for the standard price, or a saving of a penny per quarter to create a promotion rather like today's popular 'buy one get second half price' favoured by the supermarkets. In 1939 a customer magazine called Good Things To Know was launched and sold to shoppers for threepence a copy. This gave suppliers a rare opportunity to target their advertising directly to regular customers. Several took the opportunity to step ahead of their competitors. Such advertising, along with patchwork double-page newspaper advertisements showing hundreds of different threepenny and sixpenny products, was rare. 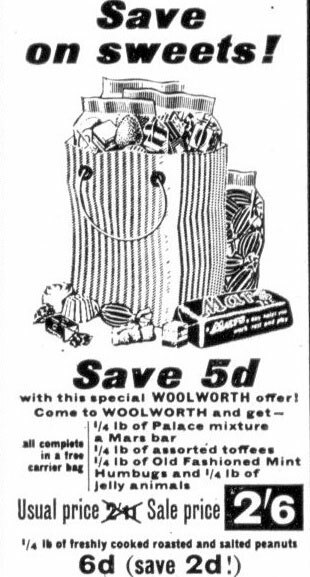 Before World War II the company only paid out to announce the opening of each new store in its local paper, and in exceptional circumstances, making a Woolies ad from the era almost as rare as a Rembrant.! In the 1950s things began to change. Facing increased competition, Executives dabbled with advertising, aiming to line up the printed words and pictures with stores' traditional window displays. Print ads often featured weigh-out sweets alongside newly introduced ranges, and offered special bundle savings for shoppers buying groceries, biscuits or general merchandise. 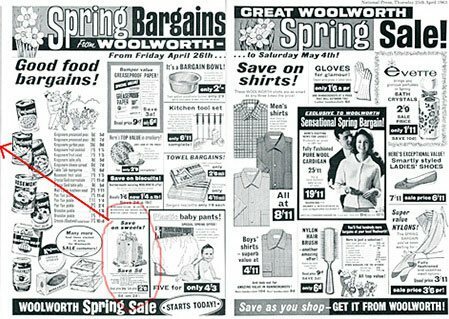 When manufacturers had new products to launch, many considered Woolworth the natural choice. Buyers sought periods of exclusivity in exchange for offering counter space quickly. Such promotions were backed by bold signs on the displays and elaborate packages of point-of-sale for the windows. 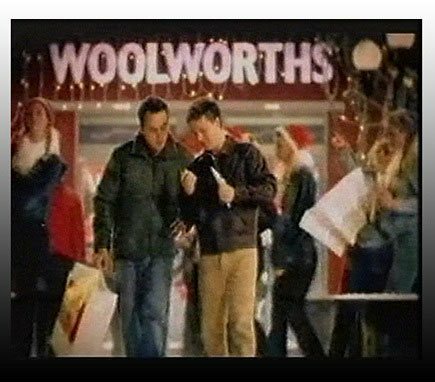 For example, when Macintoshes of Norwich introduced a sweet assortment called Quality Street and a box of chocolates branded Good News, they got six weeks' star treatment at Woolworth's. Store Managers, who had initially been sceptical that the market was already saturated, were impressed by the sales achieved. Other suppliers sought to ape the success. For much of the decade stores carried at least one sweets window display each month. These helped to boost confectionery market share, and the Woolworth pic'n'mix into a legend in its own lunchtime. 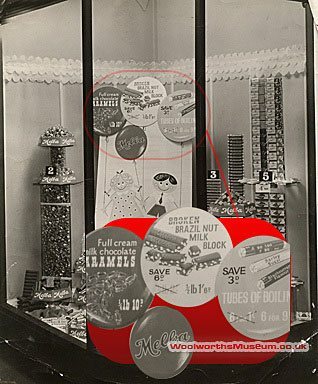 Not to be outdone, Melba, which made sweets exclusively for Woolworth, developed an arsenal of promotional material and budget products with high curb appeal, marketng items like packet sweets for pocket money prices of just one or two pennies each in the windows. Melba was proud of its long-standing relationship with F. W. Woolworth, and funded special window displays to celebrate twenty-five years service to the High Street stores. These caught the public's imagination and kept its factory, alongside the mainline railway in Peckham, South East London, busy round the clock. In a major break with tradition, after an intense debate, the Board adopted a more aggressive approach to sales promotion for the Golden Jubilee in 1959. They launched a million pound campaign in the press, cinema and, for the first time, on television. For added effect, special help was engaged in a few key locations. 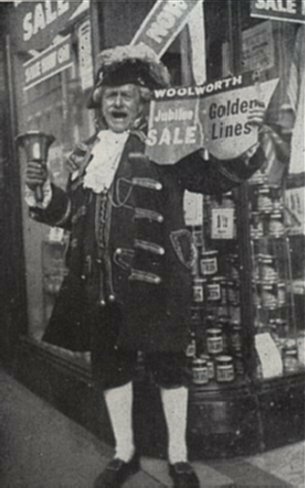 For example in Preston, Lancashire, home to the second store, opened in 1910 it enrolled the services of the Town Crier. He entered the spirit of the occasion with gusto, announcing the birthday to shoppers in Fishergate. The promotion included bundles of related products at a special price. A pre-packed carrier bag containing pic'n'mix sweets, snacks and chocolate bars proved a hit. The same formula was deployed regularly through the Sixties. The Golden Jubilee campaign proved its worth, attracting a million new regular shoppers each week. This was sustained for the next seven years, even without exposure on television after 1960. The brand did not return to the small screen until 1975. Woolworth pioneered new promotional ideas throughout the Sixties and Seventies. It did much of the groundwork to establish concepts like multibuys and link-saves. Rather than spend money on television commercials, it chose to advertise in print. The Annual Report for 1963/4 notes it was the first to book a 'double page splash' in the tabloids, apparently unaware that facing pages had been a regular feature of campaigns in the 1930s. By keeping product descriptions vague, stores were able to clear whatever surplus stock they had when making up assortment bags of chocolate bars and sweets. Tough economic times forced a change of strategy in the mid 1970s. 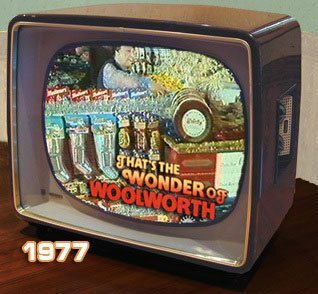 Television became the mainstay of promotional activity, with a campaign called "The Wonder of Woolworth" The commercials were exceptionally well made, investing in cinematography normally reserved for blockbuster movies. 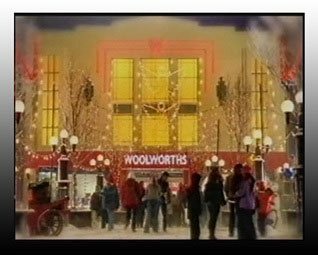 In peak season Woolworth was the first to book whole breaks for ads which ran for a full two or three minutes. Many featured the stores' popular confectionery ranges, with Quality Street tins particularly strongly featured. The concept was devised by Peter Marsh of the legendary Allen, Brady and Marsh (ABM) agency. Such was the power of the campaign that it enjoys an extraordinary level of recall today, forty years after it first aired. You can watch examples from the Marsh's 'Parade of Stars' in our virtual cinema. 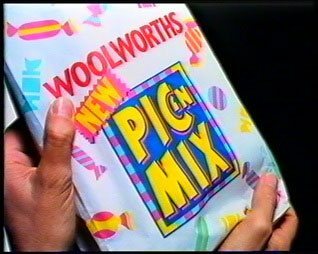 Pic'n'mix got its own television campaign when the range was relaunched as part of Kingfisher's Operation Focus in 1988, including a catchy jingle, and in 2001 Ant and Dec starred in a "Don't forget what you came in for" advertisement with the punch line "Pic'n'Mix". Right click the link and select "Save target as" ... to download the sound. Right click the link and select "Save target as.." to play the clip in your media player. To complement the charm and charisma of Anthony McPartlin and Declan Donnelly, other ads featured Don Estelle, Windsor Davies, Joe Brown, Sir Jimmy Young, Sir Harry Secombe, Georgie Fame, Edward Woodward, Bill Oddie, Terry Griffiths, and a squad of uniformed policemen.